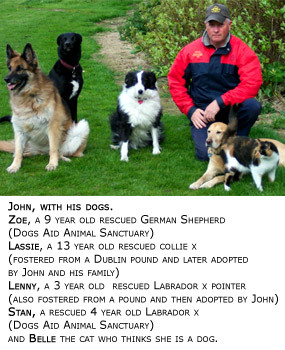 Adult and Puppy Dog Training classes in Dublin. Pet Obedience, Beginners and Advanced. 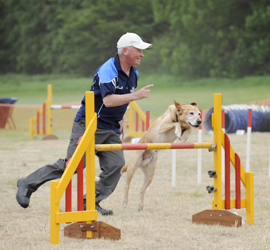 An ideal sport to keep you and your dog fit, both mentally and physically. Details of upcoming classes and course availability. 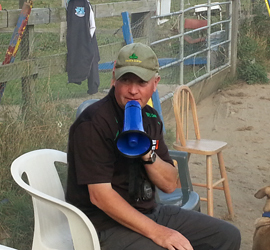 John Ward, has been training puppy and adult dogs since 1982 in a relaxed fun way. Most people get a dog hoping it will one day become a companion the whole family can enjoy. Certainly when you envisioned going for long leisurely strolls together, you were not thinking in terms of being dragged down the street. You also did not plan on having to chase after some escape artist that will not come back when called, and you certainly were not looking for an out-of-control animal to jump all over your family or friends. A well-behaved dog is a happy dog. 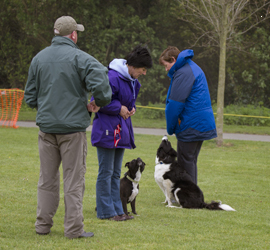 At Dublin Dog Training we teach obedience in a fun and supportive environment. We keep our classes small in order to ensure personalised attention. Our aim is to help you build a relationship with your dog, based on trust and respect. We provide all year round training at Estuary Kennels in Swords, Co. Dublin where we have indoor obedience training and outdoor agility training.